I.R. satellite imagery continues to show convection slowly increasing on the west side of the circulation. It's possible that NHC may need to revive tropical derpession 2. In a surprise turnaround, NHC named Ana on their 5 am advisory this morning. 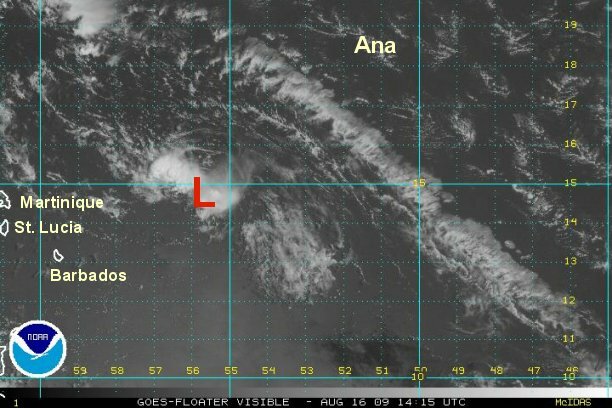 Ana was dropped by NHC as a remnant circulation for a while as it lost convection. We believe that this turn of events was caused by the forecast track of Ana into the Leeward Islands by late Sunday night or Monday. 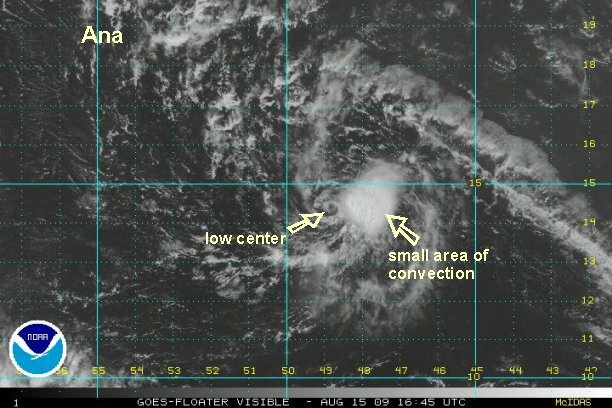 Ana is better organized than 12 hours ago, but not dramatically to go from remnant circulation to tropical storm. They were just a bit slow on bringing it back to life from yesterday afternoon. 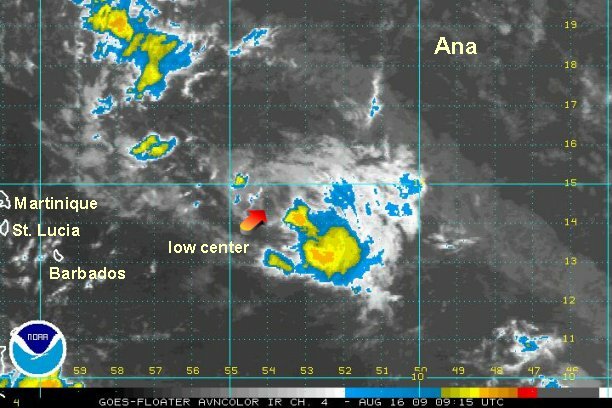 At 7:00 am edt / ast Ana was centered near 14.6 N / 46.9 W or about 945 miles east of the Lesser Antilles. It is moving west at about 16 mph. Top sustained winds are estimated at 40 mph. This would be in the thunderstorm cluster to the south of the circulation. Weaker winds are on the northern side. The forcast models have been consistent in bringing Ana into or near the Leewards. They continue to show only modest development, with the next system behind Ana being much stronger. Visible satellite imagery shows that Ana is being badly sheared. The surface low is now totally exposed. The only deep convection is on the east side of the circulation. Ana is running the threat of degenerating into a remnant circulation again. 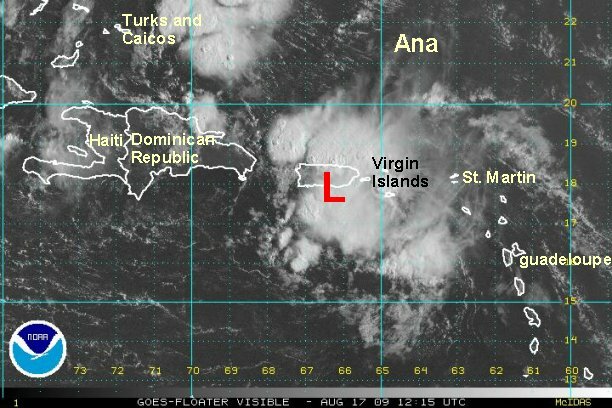 At 1:30 pm edt / ast Ana was centered near 14.6 N / 46.9 W or about 820 miles east of the Lesser Antilles. It is moving west at about 16 mph. Top sustained winds are estimated at 30 mph. NHC has Ana as a 60 mph tropical storm moving into the Bahamas. The reason for this: one model has Ana as a tropical wave, another as a category 2 hurricane. they simply split the difference. Right now, the weaker solution is looking better. NHC kept Ana alive at 40 mph on the last advisory. There is no way that winds are sustained at 40 mph. There may be a few gusts to 40 mph under the thunderstorm cluster to the east. NHC probably doesn't want to yo-yo from tropical depression to tropical storm if the shear weakens and Ana revives. Wind shear aloft is slowly lessening allowing convection to build westward near the center of circulation. With the weakness of Ana, it is allowing the low level flow dictate its direction around the subtropical high. This means that Ana will take a west, then west northwest course. That will take Ana near the Leewards late Sunday into early Monday morning. 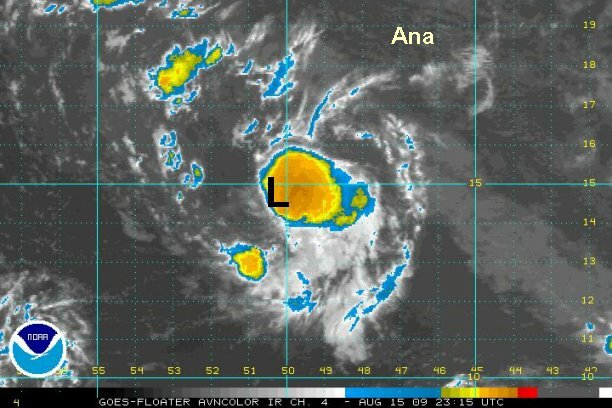 At 8:00 pm edt / ast Ana was centered near 14.4 N / 50.4 W or about 725 miles east of the Lesser Antilles. It is moving west at about 17 mph. Top sustained winds are estimated at 35 mph. The forecast models have been consistent in bringing Ana into or near the Leewards. They continue to show only modest development, with Bill after Ana being much stronger. Wind shear takes its toll on Ana again. As we mentioned yesterday, in our opinion, this is not a tropical storm. Wind shear has stripped the surface low from the convection making it very weak. Ana is moving very fast and is struggling with wind shear. It will continue to have development problems as it moves into the Leewards near Guadeloupe by very early Monday morning. Some showers are showing up on radar just east of the Leewards now. We continue to believe that Ana is not a tropical storm. NHC now (sort of ) agrees and says 40 mph is generous. 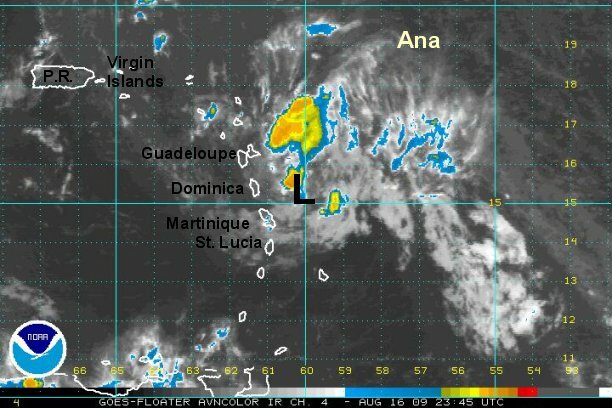 They are holding onto tropical storm status in case Ana were to strengthen before moving into the Leewards this evening. A recon will investigate this afternoon. There is a decent chance in our opinion that NHC will downgrade Ana when the reports come in. Our next update will be Sunday Evening. As expected, the earlier recon report did not find tropical storm force winds and NHC downgraded to a tropical depression. The Hurricane Hunter had difficulty in closing off a low center. All said - a very weak system. There will be no difference between a tropical wave and what Ana brings to the Leewards....that's essentially what it is. Ana likely has no surface circulation, but still a mid level one. It is trying to organize some this morning. This will be difficult with the fast motion, and even if it does, is projected to move into the Dominican Republic and Haiti by late tonight and early Tuesday. This will destroy any circulation over the high mountains. Heavy rain is still likely. 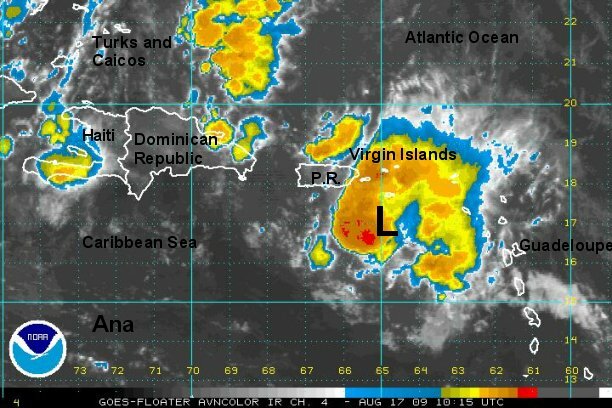 This morning heavy rain squalls and storms are near Puerto Rico and the Virgin Islands. This rain will be moving into the Dominican Republic and Haiti later today and Tuesday. Several inches of rain are likely in the mountains of Puerto Rico today with lower amounts scattered on the lowlands. Heavy rain will be Ana's legacy even though it is a poorly organized system. Heavy rain is now moving past the Virgin Islands into Puerto Rico today, heading into Haiti and the Dominican Republic tonight and tomorrow. The heaviest rains will fall on the mountain slopes where 5"+ could fall. Heavy showers will also occur on the lowlands with lesser totals. 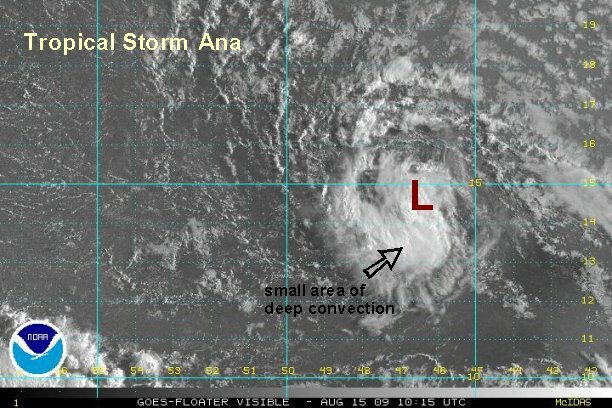 Ana has no discernible circulation any longer. Scattered showers and storms continue over the Dominican Republic and Haiti. The leftovers are merging with thundershowers over the southern Bahamas. Earlier forecast model runs had a slim possibility of regeneration in the eastern Gulf by Wednesday or Thursday. It appears that whatever of Ana is left will have trouble regenerating. This will be the last update on Ana unless regeneration occurs.